Giriraj Singh hasn't yet revealed what he plans to do while Joshi has revealed the party asked him to not contest this time. 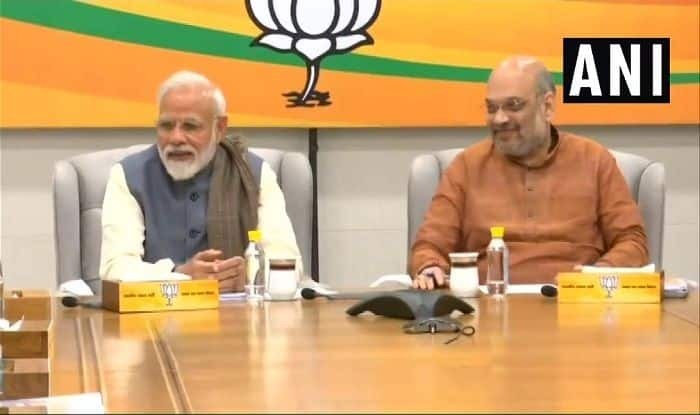 For starters, the BJP’s announcement that senior leaders Murli Manohar Joshi and L K Advani would be out of the race led to many scathing comments from the Opposition. While the announcement was only in line with the BJP’s decision to give a chance to younger leaders, leaders, right from its own rebel Shatrughan Sinha to West Bengal Chief Minister Mamata Banerjee and Delhi Chief Minister Arvind Kejriwal could not help berating the party for ignoring its elders. Mamata said the party shouldn’t be ignoring its veterans while Kejriwal used the opportunity to attack Prime Minister Narendra Modi and said one who doesn’t support his own elders wasn’t trust-worthy. He also claimed that it wasn’t a part of the Hindu culture to neglect the elderly. Joshi added fuel to the fire by writing to the people of his constituency, making it clear he had been asked not to contest this time. “Dear people of Kanpur, General Secretary of the BJP Ramlal conveyed to me today that I should not contest the ensuing parliamentary election from Kanpur and elsewhere,” Joshi reportedly wrote in a letter to the people of Kanpur. He also attacked the Congress for raising this issue and said it was a “mudda-heen” party. Party General Secretary Kailash Vijayvargiya went on to claim that both Joshi and Advani had themselves refused to contest the Lok Sabha polls. “Advani Ji and Dr Murli Manohar Joshi refused to contest the Lok Sabha polls. Similarly, I also refused to contest. If someone is unwilling (to contest) will the party give them tickets?” Vijayvargiya said. Meanwhile, the seat of BJP’s MP from Patna Sharif, actor-turned-politician Shatrughan Sinha, was handed over to Union Minister Ravi Shankar Prasad, much to the former’s frustration. In a series of tweets, Sinha slammed the BJP and quoted Newton’s third law. “Remember Newton’s third law…every action has an equal and…” “What you and your people have done with me, is still tolerable. I’m able and capable of answering your people back in the same coin (sic),” he tweeted. Soon after, Sinha, who has been particularly caustic in his criticism of the party high command and the Centre, took to Twitter to praise Congress President for promising the Minimum Income Guarantee if the grand old party came to power. Reports have been saying that Sinha would be joining the Congress on March 28. “Shatrughan Sinha will join Congress in New Delhi on March 28 at 11.30 AM … He will be our candidate from Patna Sahib,” chairman for the Bihar Congress election campaign committee Akhilesh Prasad Singh told newsmen. “However, after five years of having nurtured a constituency, I am being asked to give it up … I consider it a privilege to contest Lok Sabha polls. But this must not happen at the cost of my self-respect,” he said. Only last week, the BJP’s Bengal unit Vice-President RajKamal Pathak resigned from his post after not getting a ticket. “If I am not eligible to be a candidate, then there is no need for me to hold on to the post of the party. So I have resigned,” he said. While the elections don’t promise to be a cakewalk for the BJP, upset leaders might just make it tougher.